GreyOrange Robotics has raised $30 million (Rs. 190 crore) in its latest round of funding led by Tiger Global. The Gurgaon based company, which also has an office in Singapore, plans to use this capital towards R&D, hiring, and expansion into markets such as Asia Pacific, Middle East and Europe. The company manufactures and deploys advanced robotics systems for automation at distribution and fulﬁllment centres. Its flagship products are the Butler, a robot that’s a storage and goods-to-man order picking system, and the Sorter, a robot that sorts shipments of all sizes. With reports that robot-controlled factories show dramatically higher productivity and lower fault levels, factory automation seems to be the future of manufacturing. Warehouse management has evinced interest in India after e-commerce majors Flipkart and Amazon had announced that they’d be pushing towards automating their warehouses. GreyOrange already has Flipkart and Amazon India among its clients, in addition to companies like Jabong, Delhivery, GoJavas, Aramex and DTDC. “The GreyOrange team is helping transform the logistics industry with its high-tech, automated solutions and is now well positioned to leverage its technology globally.”, said Lee Fixel of Tiger Global. 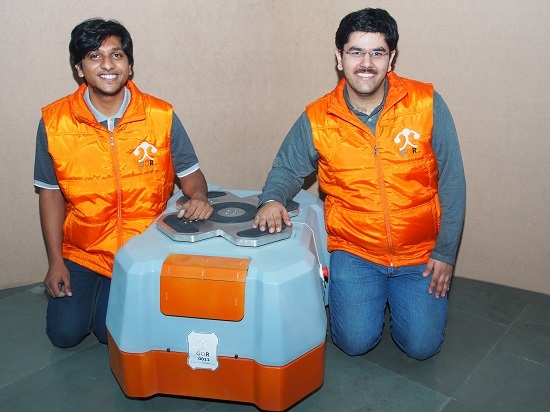 GreyOrange was founded in 2011 by BITS Pilani alumni Samay Kohli and Akash Gupta.